Chief Executive Officer, Dr Stephane Gaillard has obtained his Ph.D in 2003 in the Aix-Marseille University after a neuroscience cursus. 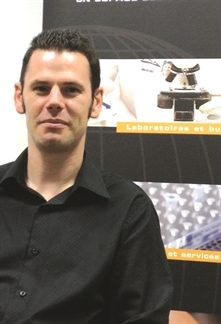 After a first post-doc in plant genetic, he joined the Institute of Developmental Biology of Marseille (IBDM) in 2006. During 6 years, he acquiered a strong expertise in mice behavioral analyses in the field of pain. Gaillard*, S., Urien*, L., Lo-Re, L., Malapert, P., Bohic, M., Reynders, A. and Moqrich, A. (2017). Genetic ablation of GINIP-expressing primary sensory neurons strongly impairs Formalin-evoked pain. Sci. Rep. 7, 43493. * co-autorship. Gaillard*, S., Lo-Re*, L., Mantilleri, A., Hepp, R., Urien, L., Malapert, P., Alonso, S., Deage, M., Kambrun, C., Landry, M., Low, S.A, Alloui, A., Lambolez, B., Scherrer, G., , Le Feuvre, Y., Bourinet, E. and Moqrich, A. (2014) GINIP, a new Gi interacting protein, functions as a key modulator of peripheral GABAB receptor-mediated analgesia. Neuron, October 1, 84(1), pp123-136. * co-autorship. Marics, I., Malapert, P., Reynders, A., Gaillard, S. and Moqrich, A. (2014). Acute Heat-Evoked Temperature Sensation Is Impaired but Not Abolished in Mice Lacking TRPV1 and TRPV3 Channels. Plos One. Jun 12;9(6):e99828 . Gorokhova, S., Gaillard, S., Urien, L., Malapert, P., Legha, W., Baronian, G., Desvignes, J-P., Alonso, S. and Moqrich, A. (2014). Uncoupling of molecular maturation from peripheral target innervation in nociceptors expressing a chimeric TrkA/TrkC receptor. Plos Genetics. Feb 6;10(2):e1004081 . Delfini, M-C., Mantilleri, A., Gaillard, S., Hao, J, Reynders, A., Malapert, P., Alonso, S., François, A., Barrere, C., Seal, R., Landry, M., Eschallier, A., Alloui, A., Bourinet, E., Delmas, P., Le Feuvre, Y. and Moqrich, A. (2013). TAFA4, a chemokine-like protein, modulates injury-induced mechanical and chemical pain hypersensitivity in mice. Cell Reports vol 5, pp378-388. Gaillard*, S. Gascon*, E., Malapert, P., Liu, Y., Rodat Despoix, L., Samokhvalov, I.M, Delmas, P., Helmbacher, F., Maina, F. and Moqrich, A. (2010). HGF-Met signaling is required for Runx1 extinction and peptidergic differentiation in primary nociceptive neurons. J. Neurosc. vol 30(37), pp12414-12423. * co-autorship. Legha, W., Gaillard, S., Gascon, E., Malapert, P., Hocine, M., Alonso, S. and Moqrich, A. (2010) stac1 and stac2 genes define discrete and distinct subsets of dorsal root ganglia neurons. Gene Expression Patterns, vol 10, pp368-375. Gaillard, S., Bailly, Y., Benoist, M., Rakitina, T., Kessler, J-P., Fronzaroli-Molinières, L., Dargent, B. and Castets, F. (2006). Targeting of the members of the striatin family to dendritic spines: role of the coiled-coil domain. Traffic. vol.7, pp 74-84.